This weekend coming- March 25th and 26th -is an exciting one in the world of alpaca breeding, as the British Alpaca Society National Show is taking place at the International Centre in Telford. The weekend provides an action-packed programme for anyone with an interest in alpacas; you can watch the halter show judging on both days and the Supreme Champion award ceremony takes place at 3.30pm on Sunday afternoon. We are not entering our alpacas in the competitions this year, but we’ll be in the trade exhibition, showing off our stunning alpaca knitted accessories and yarns. We’ll be exhibiting our own wool, plus some amazing blended yarns that combine alpaca wool with other natural fibres like merino and silk. I’ve said it before, but it’s worth repeating that alpaca wool is known as the ‘fibre of the gods’ for its incredible softness and strength. It’s as fine and soft as cashmere, and has a non-prickle factor, so even if you can’t wear sheep wool, you can almost certainly wear alpaca wool. I’d highly recommend a visit to the show- the entry charge is modest and the event provides great entertainment for the whole family. Visiting hours for the public are 9am until 5pm on Saturday and 9am to 4pm on Sunday. The entry fee (£2 per adult or £5 per family) will be donated to the Severn Hospice, which is another good reason to support this event. You can read the full programme on the British Alpaca Society National Show website and if you want to find out more about alpacas in general there’s an alpacapedia page on the main BAS website which gives lots of interesting facts about these fantastic animals (I think most people agree that alpacas are the prettiest, fluffiest and best natured members of the camel family). So I hope to see you at the show! During March we ran two needle felting workshops with Sara Robinson, a local textile artist. They took place in the Coco Alpacas shop at 9 High Street, Church Stretton. 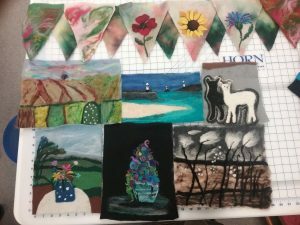 The theme of the workshops was landscapes, and with Sara’s expert tuition, every participant created a beautiful piece of work. Both workshops were very successful, and everyone had the satisfaction of taking their own project home with them. Needle felting is becoming very popular so we will be running some more beginners’ workshops in June. We will also be hosting some wet felting and Nuno felting workshops with Sara (watch this space for the dates). If you’re interested in our workshops, do get in touch and we’ll help you choose the best one for your current skill level. Sunday’s workshop creations – lovely work. 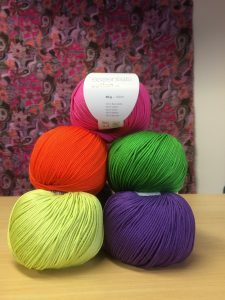 Rico Cotton is a light cotton yarn which is great for knitting and crochet and comes in some gorgeous colours. We are expecting it to arrive in the next few days, so do drop in and see it for yourself when you’re out and about in Church Stretton.